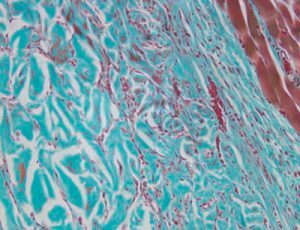 mmucoderm® is an acellular collagen matrix that offers a safe alternative to autologous soft tissue transplants in a diverse range of soft tissue grafting indications. mucoderm® is derived from porcine dermis that undergoes a multi-step purification process, which removes all non-collagenous proteins and cells as well as potential immunogens, bacteria and viruses. 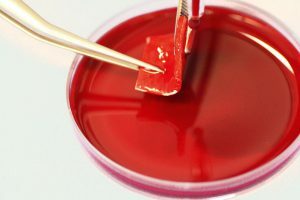 The processing results in a three-dimensional stable matrix, which consists of collagen type I and III with a natural collagen structure that resembles the human connective tissue . 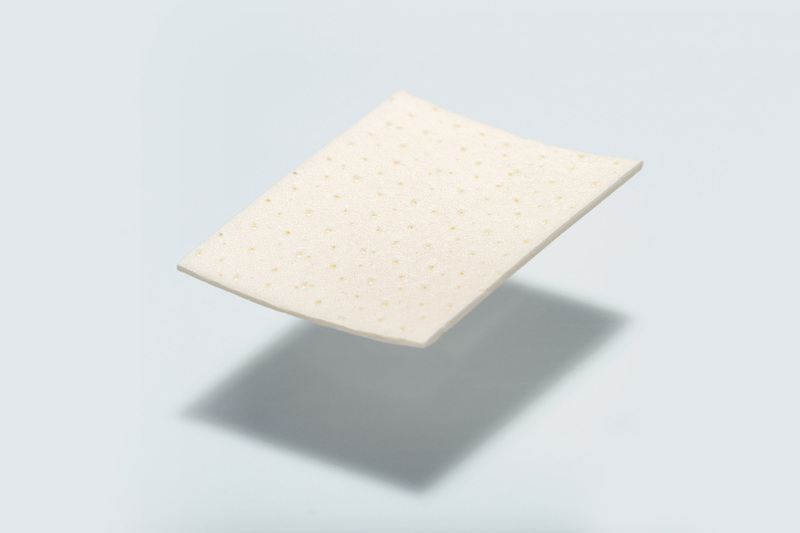 After implantation mucoderm® is continuously remodeled into patients own soft tissue. The particular, certified multi-stage cleaning process of mucoderm® effectively removes all non-collagenous proteins and cells as well as potential immunogens, bacteria and viruses. Hence, mucoderm® is an absolutely safe and pure collagen type I and III matrix. mucoderm® is a medical device regulated according EC-Guidelines. Manufacturing of mucoderm® is subject to a quality control system based on international standards (e.g. EN ISO 13485), and is regularly audited by the notified body and authorities. mucoderm® is a native collagen matrix, meaning that the natural properties of the original tissue (dermis) are preserved during the production process. This is the basis for its superior handling properties such as tear resistance and dimensional stability. 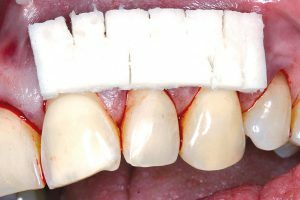 Preservation of the natural structure is also the reason that mucoderm® structure strongly resembles the architecture of the human dermis , making the matrix a suitable alternative to autologous gingival transplants. The biocompatibility of mucoderm® was proved by MTT in vitro viability assay testing . 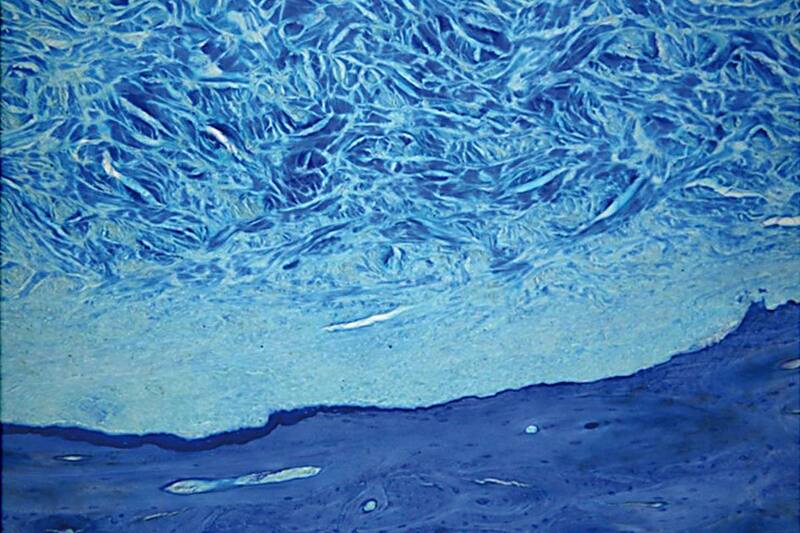 Beginning with day six, the MTT viability assay demonstrated a significantly higher viability of gingival fibroblasts, endothelial cells, and osteoblasts on mucoderm® compared to that of the control group (p<0.05). 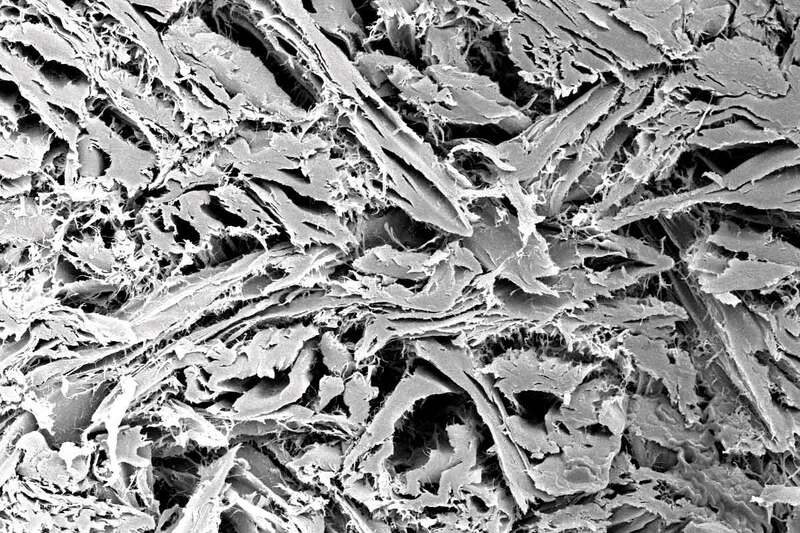 mucoderm® is characterized by an open porous collagen structure, visualized by the innovative synchrotron-based X-ray tomography : Synchrotron-based X-ray tomographic microscopy for visualization of three-dimensional collagen matrices. 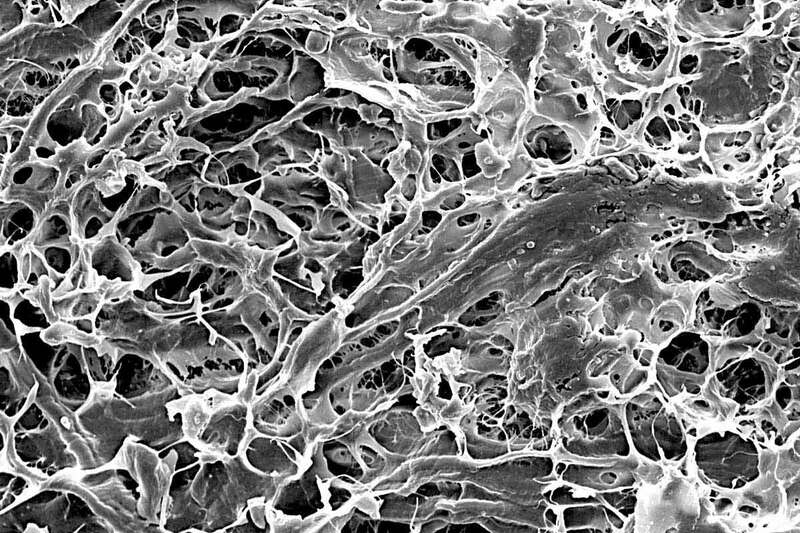 This unique structure makes mucoderm® an ideal scaffold for ingrowth of blood vessels and cells and promotes fast tissue integration and revascularization. Tissue integration and degradation were analyzed in an animal (rat model) study of Prof. Daniel Rothamel . After only two weeks, mucoderm® shows an extensive ingrowth of blood vessels as well as an inflammation-free healing with superficial cell invasion. In the following four to eight weeks, a continuous degradation with increasing homogeneous cell distribution can be observed. 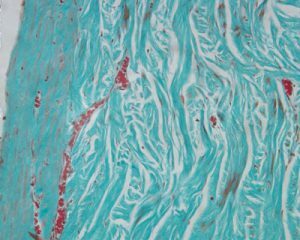 After eight weeks, still 20% of the original matrix volume is available as a scaffold for the formation and reorganization of connective tissue. After twelve weeks, mucoderm® is almost completely replaced by newly formed connective tissue. mucoderm® should only be left for open healing, if a revitalization from the surrounding or underlying wound bed is ensured. Exposure should always be avoided when used in recession coverage. Open healing is feasible in the case of a vestibuloplasty, if mucoderm® is sutured to the periosteum. In this case mucoderm® should be closely fixed to the periosteum. This facilitates an increase in the width of the attached gingiva but not in the thickening of the tissue. Open healing is also possible if only minor parts of the matrix are exposed and revascularization is ensured by the surrounding margins of the flap or by the underlying periosteum. Please note that the degradation time depends on the extent of the exposure and will be faster due to bacterial decontamination and resorption. mucoderm® should always be applied after rehydration (in sterile saline, defect blood, or platelet concentrates). Rehydration should be performed in a sterile saline solution or blood for five to 20 minutes, depending on the technique used and the desired flexibility of the matrix. 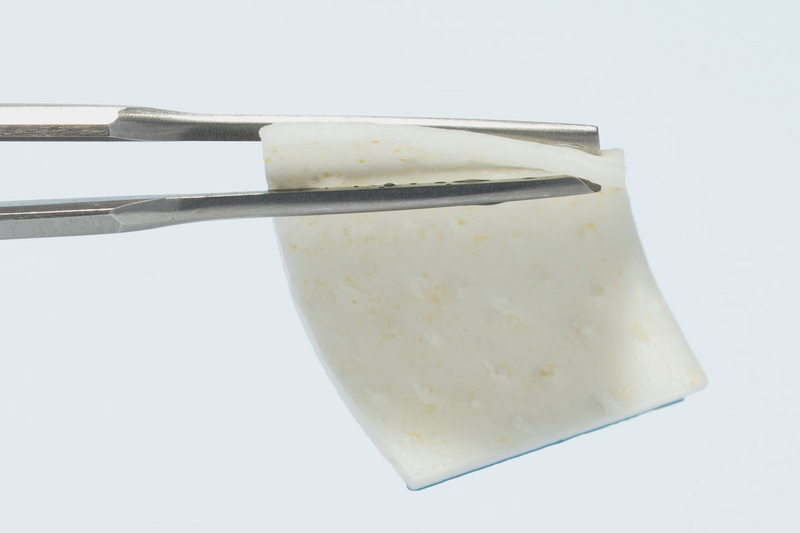 The flexibility of the mucoderm® graft increases with rehydration time. The rehydration protocol and its influence on the biomechanical properties of mucoderm® were analyzed in a study of Prof Dr. Adrian Kasaj . Size and shape of the matrix should be adapted to the size of the defect. After rehydration, mucoderm® can be easily trimmed to the desired size with a scalpel or scissors. 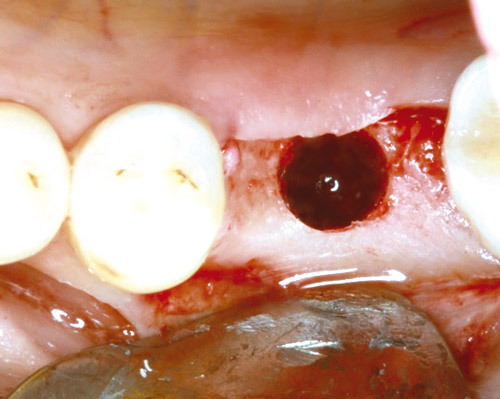 Cutting or rounding the edges of a mucoderm® matrix that has been briefly rehydrated can prevent the perforation of the gingival tissue during the flap closure. 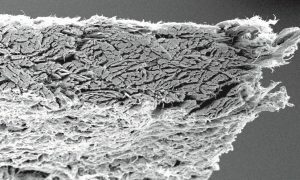 For the coverage of multi-recession defects, the surface of mucoderm® can be extended by cutting the matrix on alternating sides (mesh-graft technique) and pulling it. Following application, mucoderm® should always be stabilized to avoid micro movements and ensure undisturbed revitalization, e.g. ingrowth of vessels and cells. 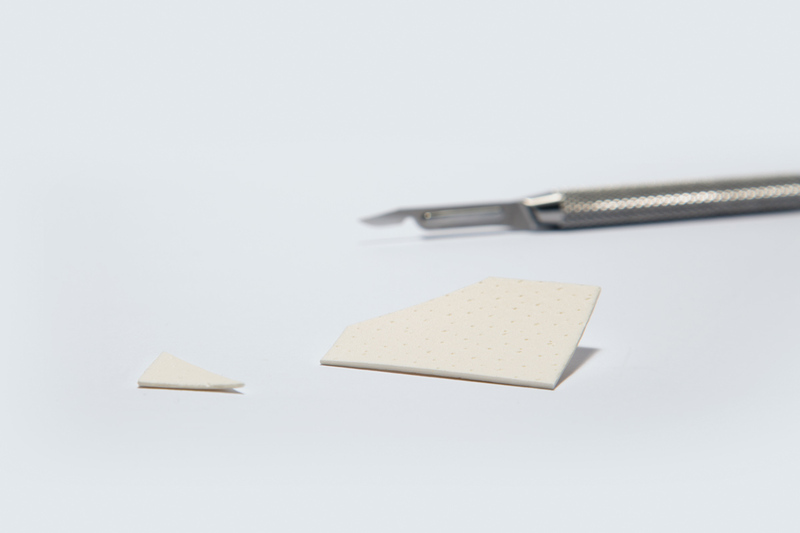 When preparing a split flap, mucoderm® should be sutured to the intact periosteum to ensure close contact between the matrix and the periosteal wound bed. Single button or cross sutures may be used; the use of resorbable sutures is recommended. mucoderm® can be used in combination with all mucogingival surgical techniques, including coronally advanced flap and tunnel techniques. Notably, the classical coronally advanced flap or the modified coronally advanced flap ensure a good view on the prepared donor bed and facilitate the coronal repositioning of the flap over the matrix. Advanced flaps need to be sufficiently mobilized to avoid tension of the soft tissue: When applying mucoderm® for recession coverage, special attention must be paid to achieve sufficient flap mobilization and tension-free closure. A proper vascular supply from the prepared flap is critical to achieve an appropriate revascularization of the mucoderm® matrix. In particular, split flaps must be sufficiently thick to ensure revitalization of the matrix and the integration into the patient’s own connective tissue. After surgery it is necessary to avoid any mechanical trauma of the treated site. 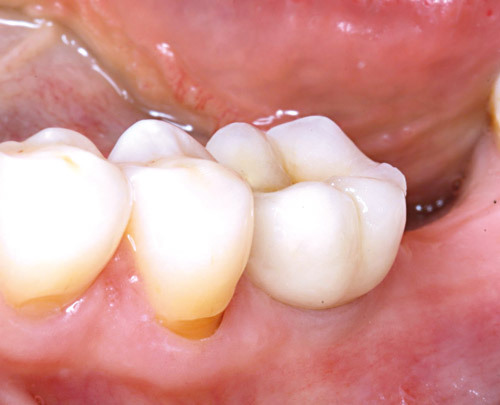 Patients should be instructed not to brush their teeth at the respective side for the four weeks following surgery. Plaque prevention can be achieved by mouth rinsing with a 0.2% chlorhexidine solution. Post-operatively, the patient should be recalled weekly for plaque control and healing evaluation. YOUR right local CONTACT PERSON!